The basketball legend opens up about "The Boardroom," which looks at the evolution of business inside the sports industry. Oh, you really were doing it. We're going to NBA superstar Kevin Durant. He not only stands tall on the court. He's reaching new heights off the court as a philanthropist and media mogul. A sneak peek of his new show, "The boardroom." Please welcome Kevin. Joining us from San Francisco. Hope you're feeling the love. What's up? You're up bright and early. Dropped 39 in the victory over the heat. You have won back-to-back NBA titles. You have won back-to-back NBA MVP awards. How are you feeling, Kevin, about the prospects of a three-peat? It feels good. I'm excited about a -- chasing the journey. It's been a great ride so far. With my teammates this year. Hopefully, we finish it off. You have so much fun. You and your team. I remember last year, when you won it all, and you all were dancing. You had Michael Jackson moves that you were doing on the court with your teammates. Now, set the record straight. You said dancing is not your thing. It didn't look like. It look like it is. What? I guess the spirit moved me a little bit. You were busting some moves there. Let's talk about the brand-new show. I want to show people the new ESPN, the magazine. Talking about your great new show. Showing it on the Jumbotron. It's called "The board room." Players, what they do off the court. I want to talk about that in a moment. First, I want to show a clip. You're going to inspire so many people because you're the 27th pick. A lot of people can't do what you do. You came into Los Angeles. The second year. You're playing with the biggest star in sports. You had a great rookie year. You can parlay that into a shoe deal. Everything. Everything. You're talking the Kyle there. Why is it important to show this side of -- of athletes off the court, Kevin? I feel like a lot of athletes are doing great things off the playing field. And I think it should be recognized. And, I feel like, you know, so many different brands have turned into huge businesses. And, I just want to give the fans an inside look. You're doing that brilliantly with this ESPN plus show that you have on. You are a fine example of what you have been able to do off the court. I had the privilege of spending time with mama dur rapt, your beautiful mother. She had high expectations for you. And you are doing that now for others. Kids where you grew up. Tell us about the new college track at the Durant center. It's the program that will help kids from starting from ninth grade trying to get into college. And helping them finish their four years in college, as well. Try to see them through the ro sesz. This is the first program of its kind back at home. I'm excited to see where it goes. What has helped you get to where you are right now, Kevin. My mom instilled a lot of good qualities in me from a kid. I had chores before I could go play ball. It taught me work ethic, discipline. Prioritizing. Now you're layplaying in your tenth NBA all-star ga can you believe? Ten all-star games. Lebron had the top pick. And he picked you. Steph was the second pick. So you and Steph curry are going to be on opposite sides of the court. How is that going to be for you? Oh, I can't wait. I'm excited. Talk a lot of trash to him. Because we got a great team. So -- hope any, we go out and get a "W." Oh, okay. Okay. We're going to look for the trash talk. Hey, Kevin, thank you so much. Sorry about the ear piece. It keeps popping out. You're such a big man. We don't have a big enough ear piece. You handle it like a pro, Kevin. You got it. You got it. Congratulations on the season you have had so far and for the new show. Thank you, Kevin. And you can stream -- you can stream "The board room "Now on the ESPN plus app. 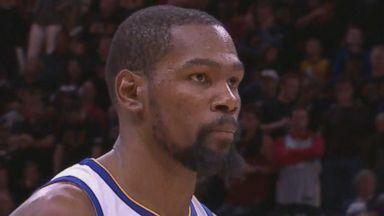 Durant scored 43 points to lead the Golden State Warriors over the Cleveland Cavaliers 110-102. ABC News' TJ Holmes reports. 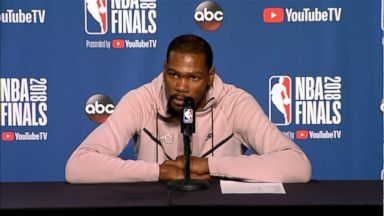 Durant scored 43 points against the Cavaliers, leading the Warriors to an 8-point victory in Cleveland to put the Warriors within one game of the title.